Fall Festivals and Halloween are a great time for church outreach, these resources will help you make the most of it. Lots of good stuff here and ALL FREE! Some new, some a few years old, but all for you to use as you'd like. Just click on the link below the title. Please pass on to other churches and friends. 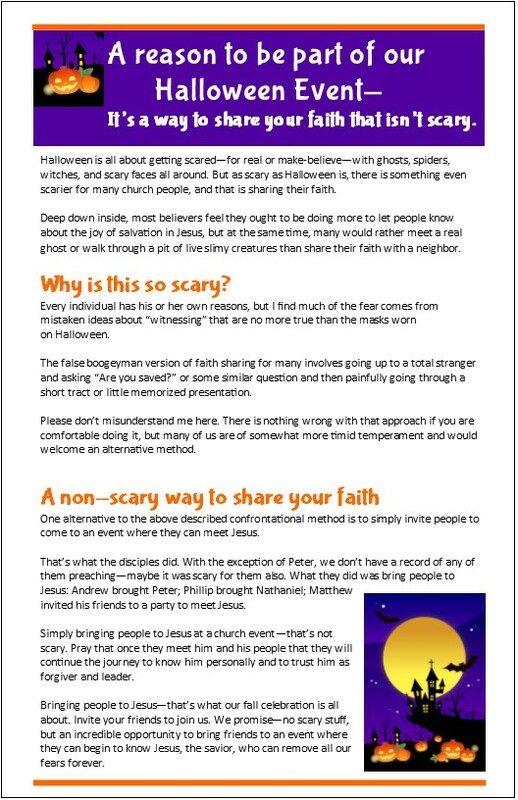 Halloween, a great time for evangelism…..really!! Older collection, some of the artwork needs updating, but still some very helpful pieces. Halloween and Fall Festivals are a great time to share your faith that isn't scary! Use these flyers to encourage your church to make the most of it. Halloween is a fantastic time for outreach and many churches make the most of it with Trunk or Treat, a Fall Festival and similar outreach activities. In addition to that, it can also be a great time to encourage your people to invite their friends to these events. To do that, I did up a flyer or bulletin insert that encourages your congregation to use this time of year and the events of your church as a great time to share their faith. Below are images of the flyer, a podcast that I did for it, and below that the text of the flyer you can use in whatever way you want. Use a card like this if you want people to return to your church after special events. When your church hosts special events this should be the start of a relationship, not simply a one-time visit. But to make that happen you need to get your visitors contact information. Following is a process you can use to get that information, samples of communications that will do it and follow-up cards after the events. There is a generic one and also examples for fall outreach and one for Christmas. The big question is—how to make that happen? 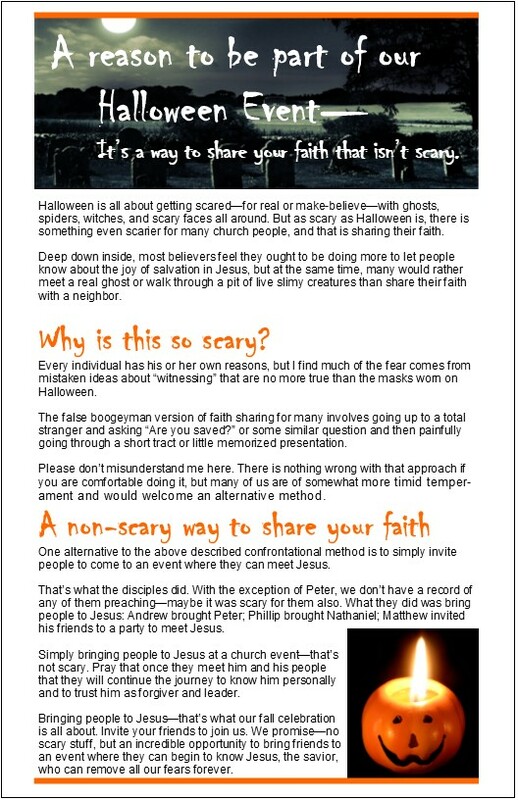 Put an invitation to church with your Halloween treats and see how the Lord might use it! 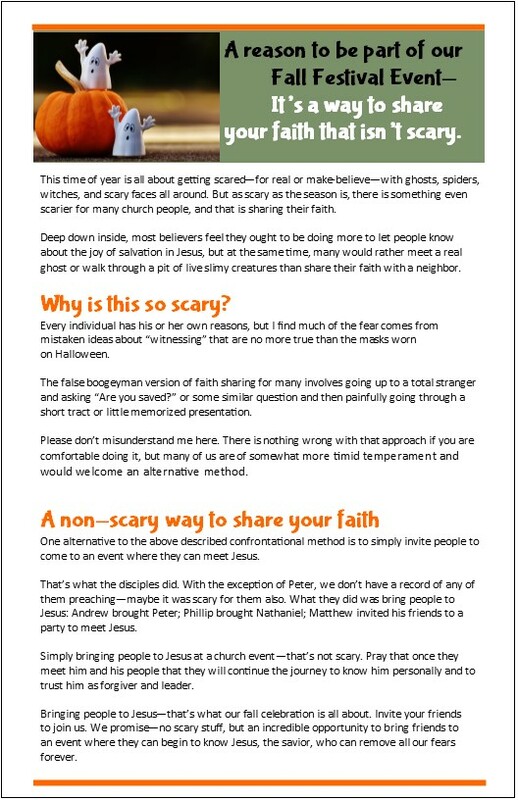 Hundreds of children will be coming to your doors this Halloween—why not take this opportunity to invite them to church? Below are some cards that can help you do this. I'm making this file FREE for everyone because it's exciting to think about what might happen if many of you make up hundreds of these cards and give them to the children of all ages who come to your homes on Halloween. Below the images is a ZIP file containing the cards. It has PDFs of business-card size invitations back to church. They are fairly generic because I wanted you to not have to do anything, but print them off and on the back side you can create a personalized message for your church. In addition to the PDFs, I also enclosed the editable MS Publisher file so if you want to change the wording or put info about your church on the front you can.